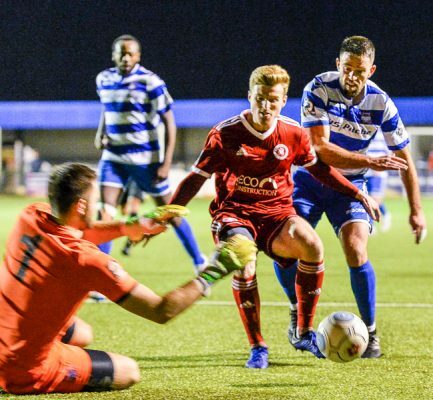 Welling United ended their away match drought with a well deserved win at Oxford City. Manager Steve King went back to a 4-3-1-2 formation and after weathering an early storm, they controlled the match. Although Oxford started the livelier, once Welling had seen off their initial burst, they controlled the match. 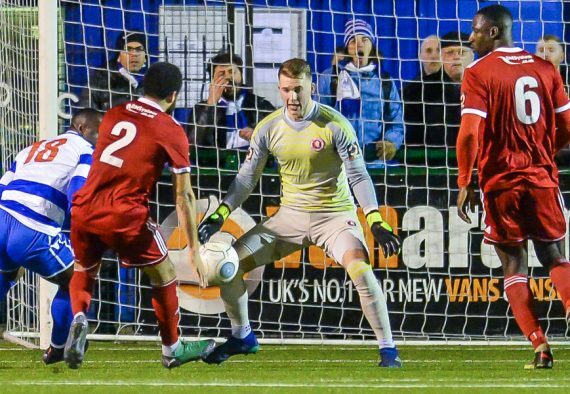 In the early exchanges, Welling goalkeeper Dan Wilks had to be alert to make an excellent save from Kabongo Tshimanga and good ones from Brandon Thomas-Asante twice and Tshimanga again. However, once they had seen that spell out, they came into the game and went ahead on twenty minutes. Danny Mills tangled with Eddie Jones and the Oxford full back brought him down in the area. Bradley Goldberg stepped up and slammed home the spot kick. Both goalkeepers then made saves, Wilks once more from Tshimanga then Craig King from a good effort by Montel Agyemang. King was again in action tipping over a Craig Braham-Barrett near post cross before Mills headed over from Agyemang’s corner. Soon after the interval Anthony Acheampong had a header cleared off the line before Welling hit the woodwork three times. Jack Barham demonstrated his skill to create an opening but his twenty yard effort flew back off the woodwork. Then Goldberg flicked on an Agyemang free kick but it came back off the inside of the post. Finally, Mills got on the end of a Jordan Gibbons low cross but his touch clipped the post on the way out. 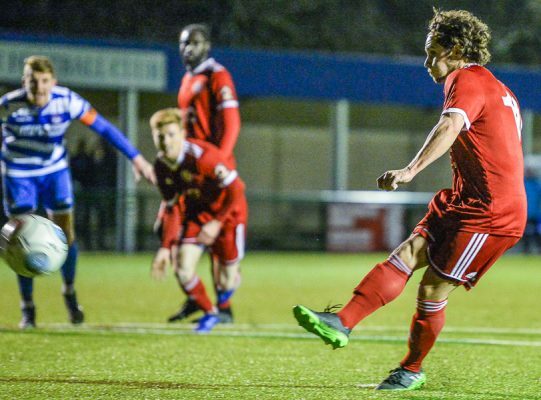 Reece Fleet tried his luck from distance but Wilks was equal to it before the impressive Barham came close for Welling with a low drive just beyond the far post. As the game came to a close, Mills had a header saved from Thierry Audel’s cross. In injury time there was one final piece of drama when the referee took a dislike to a comment from the Welling bench and sent the Wings manager to the changing rooms. 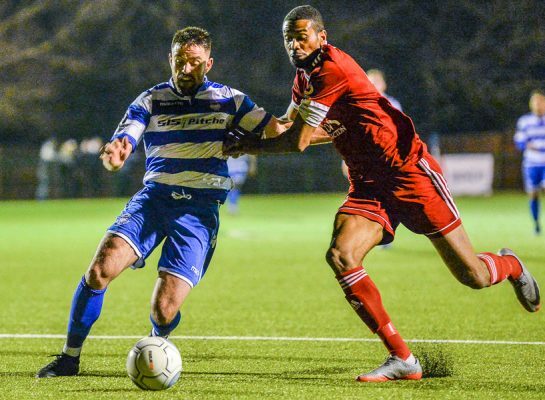 It had no effect on the outcome as Welling claimed the three points required to take them up to sixth in the league. Oxford City: King, Jones, Dielna, Ashby, Moore-Azille, Oastler, Wiltshire (Bawling 68), Fleet, Tshimanga, McEachran (Self 57), Thomas-Asante (Vine 68). Subs not used: Caro, Case. Welling United: Wilks, Gibbons, Braham-Barrett, Ijaha, Audel, Acheampong, Barham, Mendy, Mills, Goldberg (Kiernan 69), Agyemang (McCallum 69). This entry was posted	on Tuesday, February 12th, 2019 at 9:45 pm	and is filed under Football, Non-League Football. You can follow any responses to this entry through the RSS 2.0 feed. Both comments and pings are currently closed.